Area rugs wear from the bottom as a result of constant friction with the floor. Using a rug pad reduces this friction and wear. 1. Create a safer environment by reducing wrinkles and slippage of your nursery rug. Both of these are very dangerous for a toddling infant. 2. Protect your floor and nursery room rug from color transfer and staining. 3. Add comfort and cushioning to your rug, giving baby a softer place to land. 4. Vacuum your rug more easily. 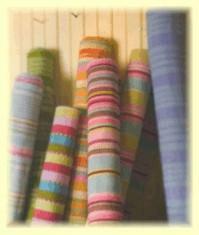 Click here for a large selection of rug pads for your nursery area rug. Regular vacuuming will prevent dirt and dust from being trodden down deep into the pile of your rug. It will also reduce the breeding of dust mites. Go over your nursery rug in both directions to remove the maximum amount of dust and to prevent matting. If you have a cut pile rug, you can vacuum using suction and a rotating beater bar. Set the beater bar to lightly vibrate the rug. If you have a loop textured rug, vacuum with suction only. The beater bar may damage the loops. No matter how careful you are, spills will happen in your baby nursery. It's just an inevitable part of your wonderful new life with baby. By mopping up these spills as quickly as possible, you can minimize their impact on your nursery rug. Blot the spill from the rug with a plain white cloth or paper towel. Don't rub or scrub. This will spread the spill and damage the pile of your rug. Work from the outer edge of the spill towards the middle to prevent spreading. My top tip for nursery rug cleaning, is to find yourself a machine washable rug. You will want to clean your rug often to eliminate allergens such as dust and dust mites, and to get rid of the smell of leftover baby spit-up and other unmentionables. Do yourself a favor and spend the time now looking for a nursery room rug that you can bung in the machine once every week or two. Otherwise you will be spending a great deal of time at the dry cleaners! If your baby room rug arrives in a roll, it may not lie flat when you first lay it out. A rug that curls at the edges can cause tripping. You will also find that the corners of your rug begin to show accelerated wear. To make the rug lie flat roll the rug in the opposite direction and store "reverse rolled" overnight. Then lay the rug out the next day. Most rugs will lie down flat once this process is completed. 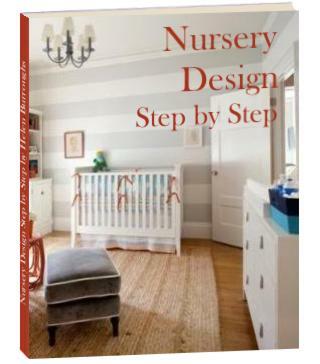 Also, allow the nursery area rug to acclimate to the environment for 48 hours, which will help it to lay flat. Visit our Nursery Room Rugs Store.